Locate Autostrada A-25 going east to Pescara. South of A-25, just east of the location where A-24 and A-25 fork is the city of Avezzano. A bit further south is the town of Capistrello and a local road connecting to the town of Filettino on the other side of a mountain. The trailhead is located at the pass where this road starts descending towards Filettino. There is a small forest road forking left, park alongside this road. (It is closed to traffic just a few more meter onwards.) This location is N41.91814, E013.36905, elevation about 1600 meter. This is an easy hike, quite suitable for families. First, continue along the forest road (the right fork) until it ends (15-20 minutes) with picnic tables at location N41.90693, E013.37582, the elevation is roughly similar to the trailhead. 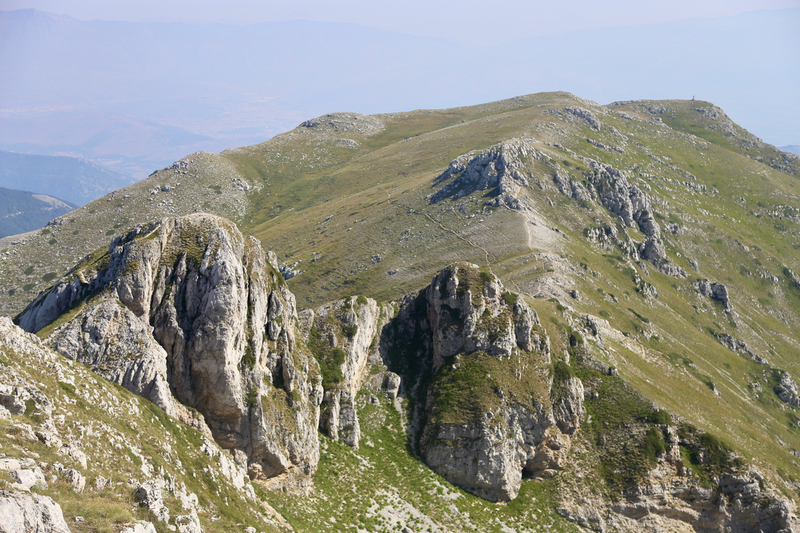 From here, there are two trails to the mountain, they meet high on the first grassy ridge. Take the one that heads left (most scenic), it runs up a small valley and climbs to the main crest. 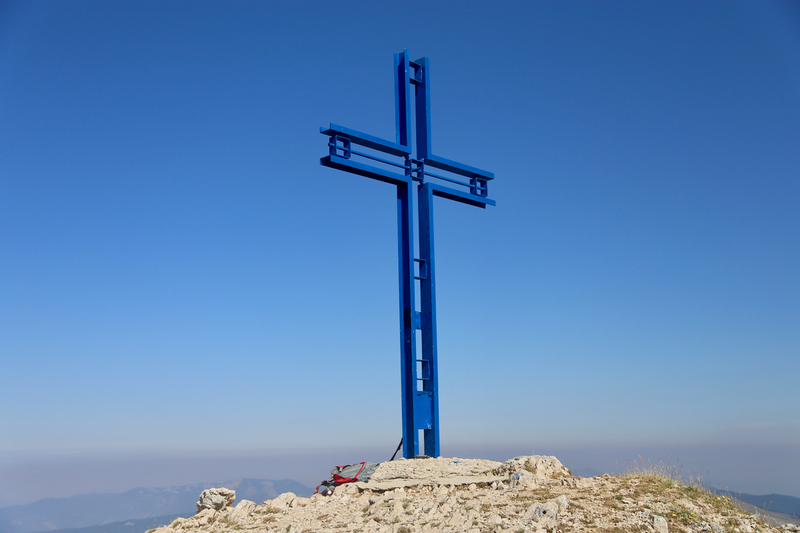 There is a cross and a small statue here. Turn right and follow the marked trail as it pretty much stays on the ridge. Next, ascend a big slope all covered in grass. I lost the trail partway up, but that has little consequence, just do an ascending traverse and locate the trail near an obvious gap in the small rocky ridge that comes up from your right hand side. Follow the trail to the next ridge-line. Here, the trail forks and two (both marked) alternatives are possible. The left fork runs along the highest ridge, while the right option contours around a few small hills. The two trails (almost) meet again in the last saddle before the final summit slope. Again, there are two alternatives. 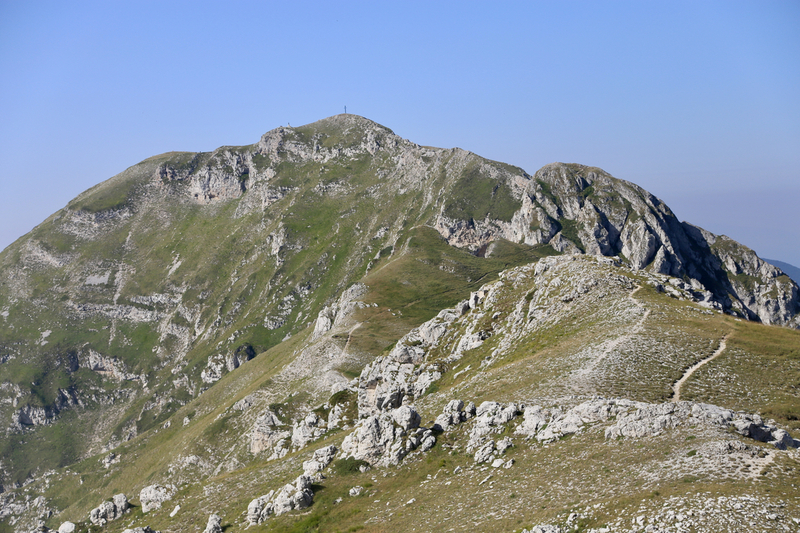 The right hand trail now bypasses a rock gendarme on its right hand side, then climbs gently to the summit. 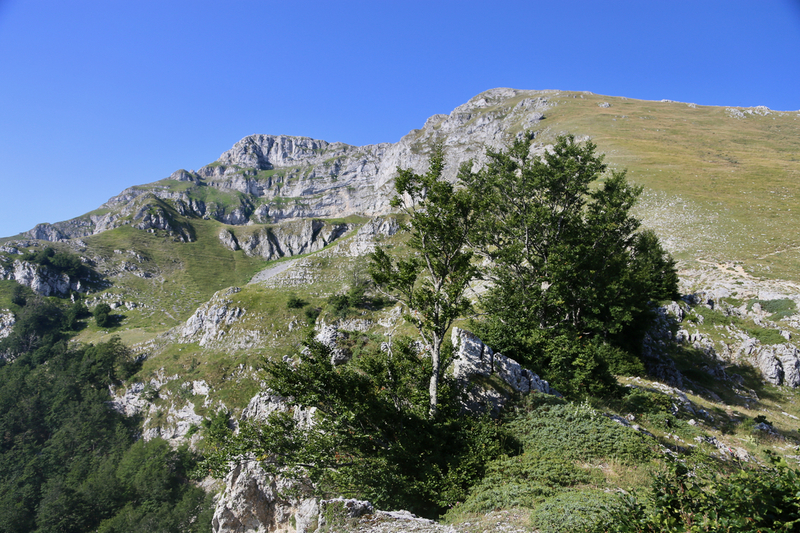 The left hand trail will run to the base of the gendarme, then climb it via a small, narrow gully. This section is (YDS) class 2+, but only for a couple of meter. One subsequently will do a short descent on the far side of the gendarme in order to join up with the bypass trail. A few more steps and you are at the summit. 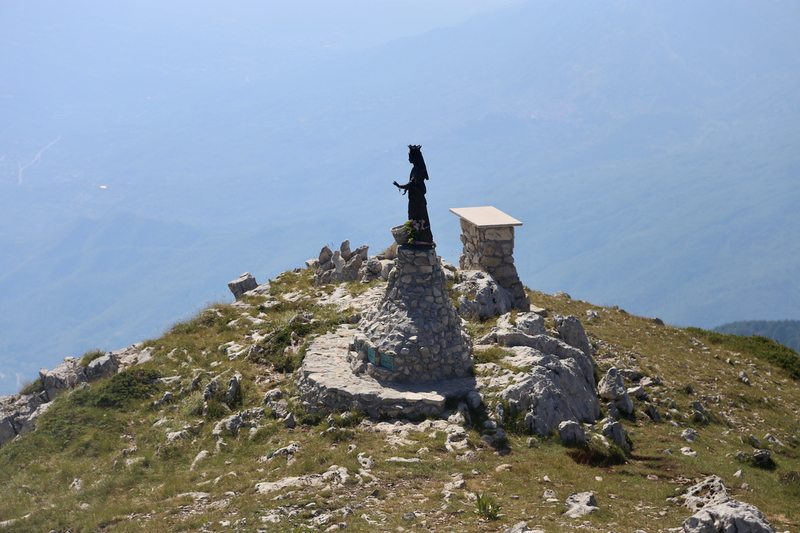 There is a small statue slightly lower on the summit. I left our hotel around 0605, then had a nice drive towards the intended trailhead. 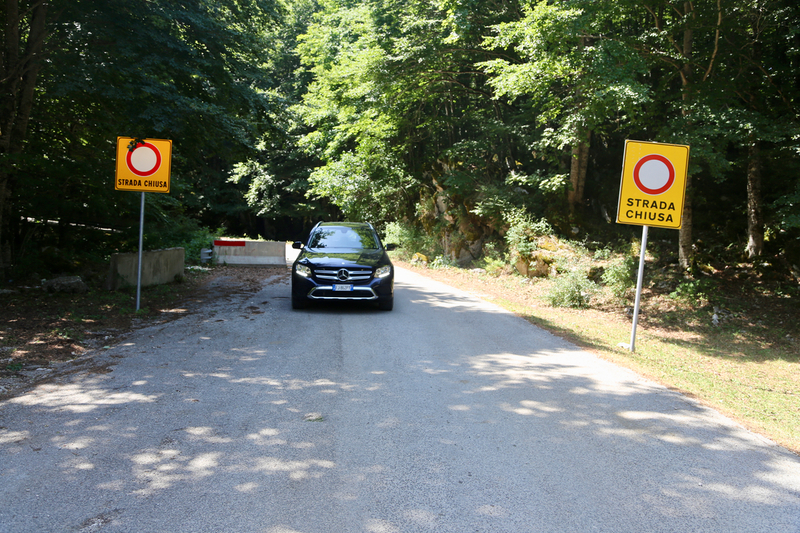 Ascending the mountain road that connects Capistrello with Filettino, I ran into roadsigns, posted on both sides of the road, saying "do not enter" with the added text "STRADA CHIUSA". My Italian is not perfect, but this did indeed look very much like "Road Closed". Altenative routes/roads to my intended trailhead would imply rather lengthy detours. Thus, it seemed like my best option would be to not fully understand this Italian and proceed with caution. This worked out well, no obvious reason for closing this road (except some traces of rock fall). I was parked at the trailhead by 0800 and ready to hike at 0810. Arriving at the end of the forest road, I picked the left alternative and soon made the main crest having good views down slope, but also a nice view of the mountain ahead. The trail that traversed the grassy slope sort of vanished, but this did not really matter. I recovered the trail higher up near the rocky ridge and continued to the next ridgeline. I picked the (left) high alternative what regards trails and passed across some minor summit before seeing the last part of the route. Descending to the last col before the summit, I quickly decided to continue along the upper trail and check out the ascent of the gendarme. A very short, easy scramble, I think (YDS) class 2+ is about right, you would normally use your hands a little. I arrived at the summit at 0950, so 1:40 from the car with several photo stops along the way. I signed the summit register, looked around. Unfortunately, it was rather a lot of haze in the air. 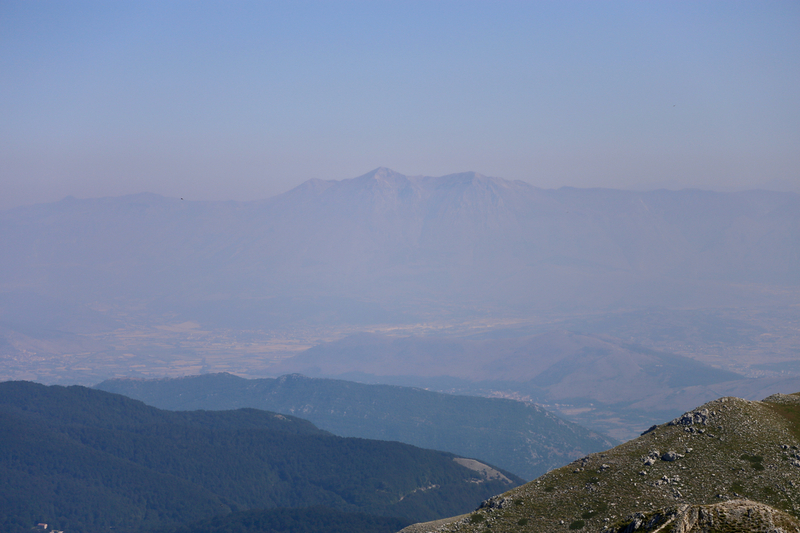 I could easily see Monte Velino to the north, but all other peaks were hidden in haze. I left after 15 minutes and took the lower "express route" as my preferred trail going back. 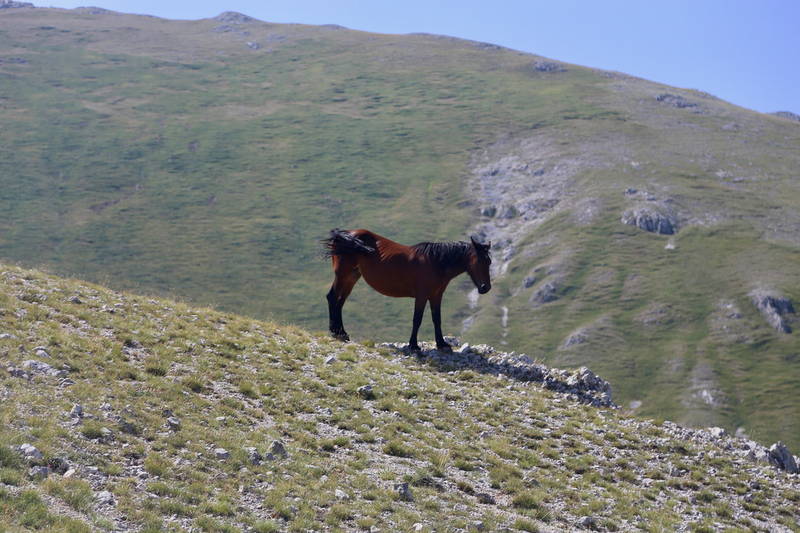 Not a single hiker all day, but at least I did see a horse on my return hike. Arriving back at my car at 1115, so 1:10 for the return hike. I drove back to our hotel, concluding my trip of the day already at 1300. 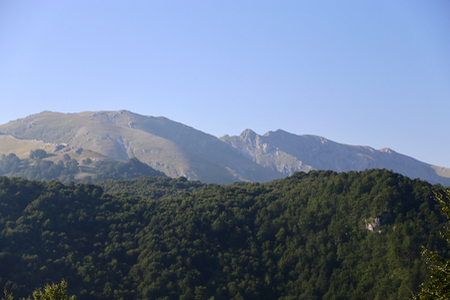 Monte Viglio, as seen from the road to Filettino, the summit is far right. The two routes, seen when looking back from the summit. 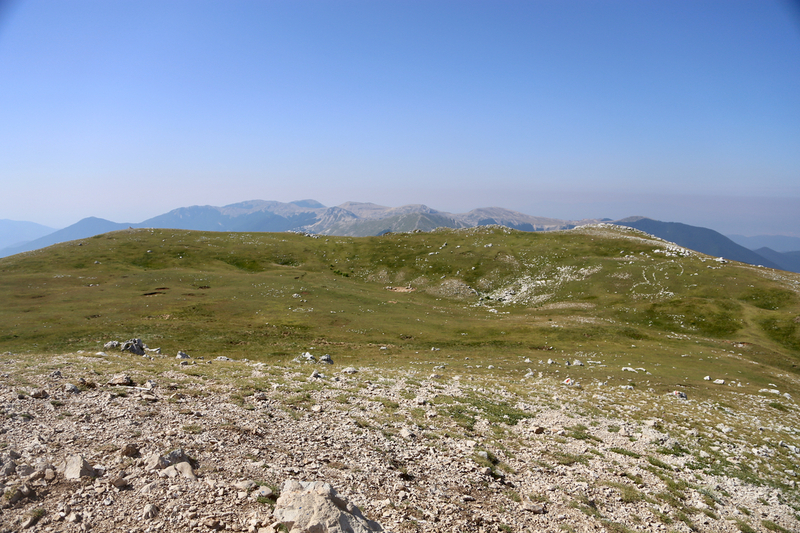 A small plateau near the summit.